A shorter version of this essay appeared in the Springfield News-Leader, October 31, 2016, p. 2C. That America is divided is news to no one—particularly in this divisive Presidential election year (2016). The body politic seems to agree on very little, and our citizenry as a whole seems to have very little in common. I don't usually stumble about in political issues, but since the election this year has been particularly fractious, it set me to thinking about the ethical center of the country. If there is such a center, what might it be? Our grand experiment in democracy has not united us, as our current incorrigible political discourse attests. Because America is a nation of immigrants our ethnicity does not unite us—we are, and are destined to remain, a nation of diverse ethnicities with different values and cultural traditions. Not even our vaunted secular educational system succeeds in uniting us because of homeschooling and private religiously-oriented high schools and colleges. Our religion does not unite us in terms of beliefs and values because the melting pot that is America hasn't worked on religion—we don't even do toleration well. What we seem to have in common is that we are a secular people—that is, our society for the most part is "rationally organized around impersonal and utilitarian values and patterns and receptive to new traits." The preamble to the U. S. Constitution is a very hopeful statement of the ideals and intent of the founders of the country. It is a vision of a "shining city on a hill," but the reality is far different. Today we are scarcely a "more perfect union," and cannot even agree on the nature of Justice in the social order. Too often domestic tranquility hinges on the neighborhood in which one lives. Congress bickers, but cannot agree on, how much or how little should be provided for the common defense. We all want for ourselves and our posterity the blessings of liberty, and do not seem bothered that not all citizens fully share in liberty's blessings. The only thing we seem to agree on is the emphasis in the preamble on promoting the general welfare, as long as the welfare being promoted is mine—and this is my point: we all agree on the utilitarian value that "my welfare" should be promoted; yet we seem unaware that a government formed "of the people, by the people, and for the people" comes at some individual personal cost; put simply: freedom is not completely free. A representative democracy, and the high ideals of the preamble to the constitution, can only succeed if they aim at working for all citizens, and that means concessions are required on everyone's part. Hence the goal is not "my welfare" but should be "our common welfare." Economic benefits must aim always at providing for the common good. An economic rising tide must "raise the boats of all citizens" to be successful. The traditions and beliefs of a religious majority cannot be mandated so as to compromise the religious traditions of minority groups. In other words, for a democratic society to function toleration is required. The goal is to achieve the greatest amount of liberty under the law for the greatest number of people. Politics is the art of the possible, which always involves compromise. Everybody gets a little and gives a little in return. In a democracy the most successful politician is the one skilled at deal making, for s/he moves the country forward. A wise man once said, "a state divided cannot stand" (Mark 3:24-25). We would do well to heed his caution, and seek common ground. 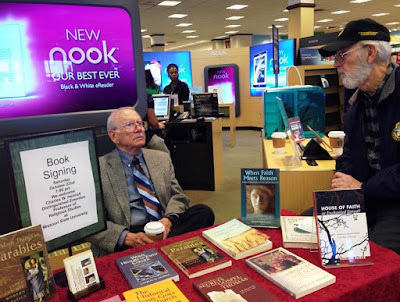 Charles W. Hedrick signing books and meeting the public at Barnes and Noble Springfield, Missouri on Saturday 10/22/16. Charlie is chatting with Bill Lord, Chaplain (Colonel) U. S. Army (retired). There are actually other statements in Mark's Gospel that strike me as odd (that is: peculiar, strange, or unexpected), but these two locutions are markedly so. We have come to rely on Mark as the earliest gospel—at least Matthew and Luke wrote their gospels relying on Mark as a source. Luke even noted there were many who had tried their hand at "compiling a narrative" of the doings and sayings of Jesus, so s/he apparently accepted Mark's narrative as the most acceptable of the "many" who wrote (Luke 1:1)—and yet Luke frequently edits out and changes much of Mark's narrative. And there were going out to him all the region of Judea, and all the people of Jerusalem; and they were being baptized by him in the river Jordan confessing their sins (1:5, Hedrick; see also 1:28, 33). In the time of Jesus the "region/country" of Judea incorporated the area around Jerusalem extending northward to about the valley of Aijalon and southward to Masada, and included eight to ten villages. The population of the city of Jerusalem during the time of Jesus has been estimated at an upper limit of around 25,000 to 30,000.1 If the population of Jerusalem was only half this number, the idea that every single person in the city and all the villages in the region of Judea were going out, and eventually being baptized by John, is simply not credible. Luke eliminates this verse, but Matthew (3:5) repeats the exaggeration with a slight modification. Mark borders on another unfortunate exaggeration when he writes: "And [Jesus] could do no mighty work there"; Mark avoids the exaggeration by adding: "except that he laid his hands upon a few sick people and healed them (6:5; see Matthew 13:58 for a more carefully worded statement). People from Jerusalem and from all over Judea traveled out into the Judean waste-lands to see and hear John (Living New Testament). Translators have taken the odd locution to refer either to Jesus already being in the boat (see Mark 4:2), or to the appearance or condition of Jesus (as he was, NKJ, or just/even as he was: NIV, Moffatt, Douay). Goodspeed and NEB use words other than Mark's in their translation. And TEV simply eliminates the obscure phrase. Both Luke and Matthew, resolve Mark's lack of clarity by having Jesus get into the boat with the disciples when they leave, and thus eliminate the obscure phrase as he was (Luke 8:22; Matthew 8:23). The larger issue raised by these two odd locutions is the ethics of Bible translation.2 Does the interpreter/translator allow Mark's problematic locutions to remain, or does the interpreter/translator change Mark's text in order to resolve the ambiguity in the interests of maintaining a text suitable for worship, since public reading of the Bible should not raise questions in the minds of the worshippers? To put the matter differently, does the interpreter/translator serve the interests of the church, or serve a historical sense that always demands complete transparency? 1J. Jeremias, Jerusalem in the time of Jesus (Philadelphia: Fortress, 1968), 84. 2C. W. Hedrick, "Satyrs or Wild Goats. The Politics of Translating the Bible," The Fourth R 24.5 (November –December 2012):21-22, 24.